In case you don’t already know, Microsoft’s stab at Apple’s iPod, the Zune, will be released on November 14, 2006 for a retail price of $249. The Microsoft Zune features 30GB of storage, WiFi for sharing music, photos, or videos, a FM Tuner, and a bright 3″ LCD display. The Zune supports playback of WMA, MP3, AAC, and music purchased from the “Zune Marketplace”. 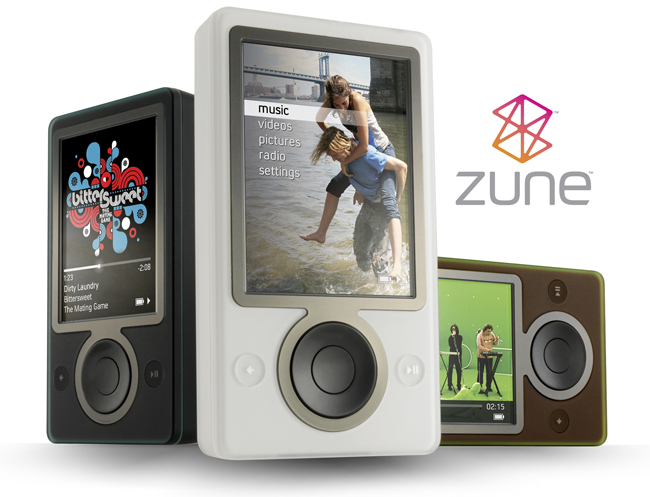 (also supports WMV, MP4, and H.264 video formats) As displayed in the image above, the Zune will initially be available in three colors: black, brown, or white. Unlike iPods the Zune will only be available in one storage capacity size, 30GB. 2b honest the MZune looks kinda of cool in its own way. The market response is something im lookin 4ward 2. Hopefully its features are well though out and try attack at the iPod craze. Skatter Tech will be getting a Zune within 1-3 weeks. So if anyone is interested, check back soon because we will be posting a full review.